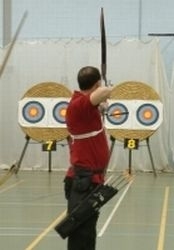 Bannockburn Bowmen held two Scottish Record Status competitions on Sunday the 9th of October 2011. The result of the Bannockburn Bowmen Open WORCESTER can be viewed here and the Bannockburn Bowmen Open FITA 18 can be viewed here. Congratulations to all partiipating archers in what was a very successful day of competition. Bannockburn Spider badge awards for this competition can be viewed here.